Will You Better Protect Your Hearing By Being Picky About Your Plate? Does what eat count when it comes to protecting your hearing? One thing doctors know for sure is that nutrition is critical for just about everything to do with health including your hearing. The truth is the most effective way to safeguard your hearing is to be conscious of noise hazards like the headphones you wear to listen to music or loud environmental sounds you can’t control like a jackhammer or traffic. If you already protect your ears from loud noises then it’s time to shift your focus to other proactive lifestyle choices like diet and exercise. 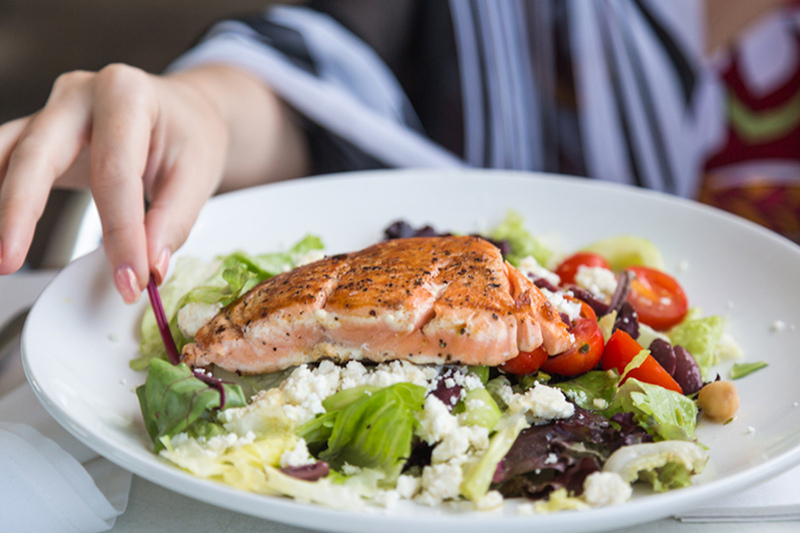 What foods do you want on your plate for better hearing health? Omega-3 fatty acids are a good dietary addition for just about every function in your body including your hearing. Scientists from the University of Sydney state in a 2010 paper published in The American Journal of Clinical Nutrition that adding just two helpings of oily fish — a common source of omega-3 fatty acids — every week lowers your risk of age-related hearing loss by up to 42 percent. That’s just one of a number of good reasons to include fatty acids in your diet, though. Omega-3 is connected to the reduction of blood triglycerides, it reduces the risk of dementia and is the right choice for better heart health. Now, we can add hearing to the list too. Fish is a good source of this critical element but be careful what kind of fish you choose. Look for wild salmon, tuna or sardines if you want more omega-3 fatty acid. Folate is a type of folic acid, one that is often given to women expecting a baby to help prevent neural tube defects during gestation. Folic acid is also listed on the World Health Association’s List of Essential Medicines. At least one study indicates that taking folate will reduce the risk of age-related hearing loss by as much as 35 percent. The recommended daily intake of folate is 400 micrograms, and the food is always the best source. You’ll find folate in those green leafy vegetables, the dark ones, like spinach or kale, along with beans and in black-eyed peas. Potassium plays an important role in the balancing of specific metabolic processes such as fluid levels and that makes it critical for good hearing, too. The inner ear is where you’ll find the cochlea, a bony labyrinth that is filled with fluid. As sound enters your ear, the fluid vibrates. Those vibrations are what move the hair cells so they send electrical messages the brain can translate into sound. Clearly, having the right balance of fluid in the inner ear is necessary for ear health. In fact, the current theory about conditions that affect hearing like Meniere’s disease relates directly to this fluid balance. A change in fluid levels might also be a factor in the age-related hearing loss, so add some potatoes, spinach, bananas or yogurt to your daily diet to ensure you get the potassium you need. Zinc is another one of those minerals that matters when it comes to good health, especially for the immune system. It’s important to balance your intake, though. Too much is not good for you. The recommended dosage for zinc is around 11 mg per day for adults. Just enough zinc each day will help fight nasty ear infections that interfere with and damage hearing. Zinc also improves wound healing, including the ones inside the ear canal after an infection. There is some evidence that zinc intake might be beneficial for those with tinnitus, too. Tinnitus is the phantom noises that people hear when there is a change in their hearing. For some it is a ringing noise, others hear wind blowing or clicking. More evidence is needed to prove that zinc is effective in the treatment of tinnitus, however, but it can’t hurt. Foods rich in zinc include beef, nuts, and beans. You can even get it in dark chocolate, so go ahead and add a tasty treat to that plate for more zinc. Good healthy habits like a balanced diet and exercise are also the right choice to lower the risk of chronic illnesses like high blood pressure, diabetes, and heart disease. Having any one of those conditions increases your odds of age-related hearing loss. Add the direct benefit eating certain foods has on ear health, why wouldn’t you get picky about what you put on your plate?